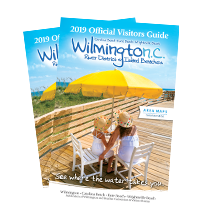 Whether you’re a traveling craft beer aficionado or a beer loving vacationer with a taste for good suds, Wilmington and our Island beaches have gained notoriety as one of the country’s fastest growing craft beer hot spots. Complementing our unique breweries are festivals and events and several beer-carrying bottleshops—strategically located throughout the city on the Wilmington Ale Trail—for easy access to some of the world’s finest beers and wines. Chances are you&apos;ll encounter one of our food trucks serving delicious on-the-go eats while on your brewery adventure. So if you’re looking for a beer-based getaway, why not book it at the coast? Here are just a few of our top hops spots in the brewing community. Meet some of Wilmington's latest and greatest brewmasters and get a taste of the craft beer scene in this video. Travel down Wilmington's Ale Trail to experience craft breweries, bottle shops and exceptional bars and restaurants. Hop aboard Port City Brew Bus for good times and great beer as you sample craft beers from each stop on the Wilmington Ale Trail. Many local breweries offer tasting trays with samples of their craft beers, to find more than one favorite new brew. Our State Magazine offers a 36 Hour Guide to Wilmington's Craft Beer Scene for you to sip your way through. Check out what UNC-TV had to say about the growing craft beer industry in WIlmington in this NC Weekend video. They said we're one of the beeriest beach towns! Check out these accolades and plan a trip to experience our up-and-coming brew scene. Visit these breweries from the river to the sea to taste one-of-a-kind lagers, IPAs, pale ales and more, all handcrafted by passionate local brewmasters. Book your brew-cation around one of these festivals, or hop on the Port City Brew Bus to sample the local craft beers we're known for. Take a step into the unique bottleshops and homebrew suppliers of Wilmington, offering eclectic mixes of hops, good times and supplies for your next happy hour. Don't just take our word for it! Our breweries, bottle shops and craft beer scene are receiving accolades left and right. Get to know the brewmasters who make Wilmington craft beer taste great with this series from the Wilmington Ale Trail.